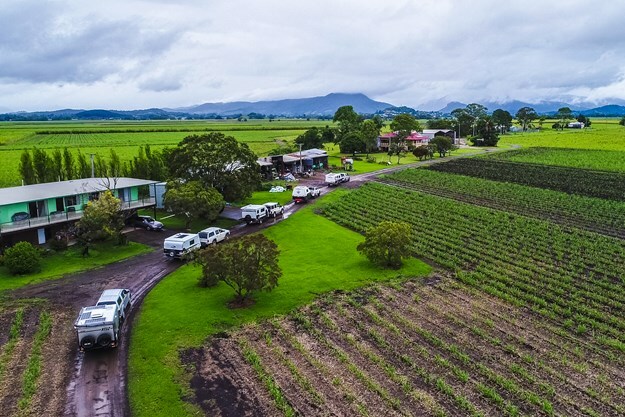 If there is one debate that keeps the phones and emails running hot at Camper Trailer Australia, it’s the battle between imported camper trailers and locally made camper trailers – which essentially means Chinese versus Aussie. 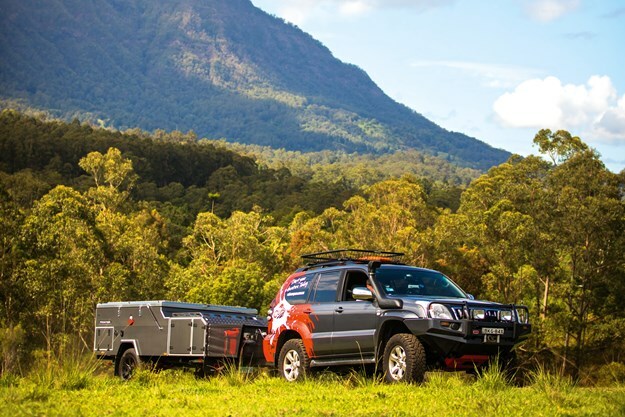 For the Australians who want to head out and explore what the country has to offer, the question is: should I buy an imported camper trailer? Or should I pay more for an Australian camper trailer? This article will help you answer these questions. Humans have attached tents to trailers since they invented the automobile. In post-war Europe this evolved into the Combi Camp, a rearfold design that we would instantly recognise as a camper trailer today. These largely on-road lightweight campers were readily adapted to Australian conditions in the 1970s. Throughout the 1970s, 80s and 90s a steady market developed for a limited range of manufacturers with relatively small research and development budgets. Then in the early 2000s, a tsunami of popularity arrived. It seemed everyone who could weld and who knew someone with a sewing machine jumped on the bandwagon as a manufacturer. There were three basic formats: rearfold hardfloor, sidefold softfloor and pop-top with extending end beds. There were 197 Australian camper trailer manufacturers in 2008, according to the campertrailers.org site. At the same time, campertrailers.org noticed a high percent of their 1.5 million monthly hits were coming from China. Australia ranked first, USA second and China third – despite the relative unpopularity of camping in China. Nobody could understand or explain this phenomena, though now, in hindsight, it is obvious. 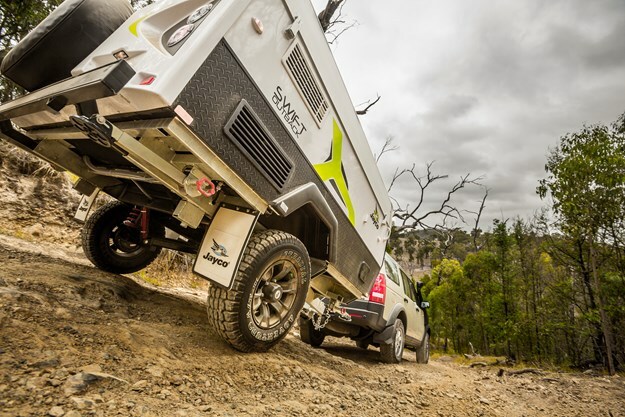 This interest from China was coming from potential Chinese manufacturers dredging about, looking for ideas on how to build camper trailers and gauging the level of interest in Australia. At the time, only a trickle of camper trailers were being imported into Australia, and frankly they were mostly pretty awful. Poor welding, dysfunctional components, missing kitchens, sagging canvas and seemingly self-generating rust formed part of an endless list of failings that notoriously tended to strike unfortunate owners just days into major trips. A few years after the first wave of Chinese campers came the South African products, and they were pretty good from the get-go. These had been developed by people who actually used them. They were sold to the South African military and had been well tested in an environment very similar to Australia’s. People who know little about campers or camping often enter the field, drawn in by the cheap potential price of Chinese imports and a ready market here. This can sometimes lead to a huge gap between what the customer wants and the product on offer. For example, one brand of imported camper (which no longer exists) was on offer at the 2014 Sydney Caravan and Camping show with their model's wheel nuts on back-to-front, with the taper to the outside. Only recently, counterfeit copies of Cruisemaster’s excellent DO-35 hitch became available. These had the potential to decouple while being used. Hopefully by now they have been consigned to the scrap metal yard – but the manufacturer’s apparent inability to successfully copy a vital component such as a hitch leaves one wondering what other mistakes leak through the system without being picked up? For example, it’s only a couple of years since Chinese hitches with fraudulent certification numbers were widely being sold. Certification numbers are there for a reason: to show hitches have undergone approved testing, demonstrating they are strong enough and properly engineered to be safe. However, it must be noted that the quality of imported campers has risen greatly in the last few years. The days of all Chinese campers being under $10,000 are long gone. Exactly which factory your potential camper comes from will have a great bearing on the detail and quality. The problem is knowing which are the good ones and which aren’t. There has been a significant blurring of the edges in camper manufacture in recent years. In your average Australian built camper the sink, slides, fridge and many other major components are all usually Chinese made, because that’s where most of the global brands have their equipment made. In fact, many local manufacturers import whole components such as kitchens, gas struts and similar modules as a means of keeping costs down and streamlining production. Conversely, regulations and market pressures have forced some Australian features onto Chinese imports. Australian gas certification requirements basically demand all gas plumbing is done in Australia. Much wiring and plumbing is undertaken locally as well, following functional problems causing warranty difficulties with early imports. The use of locally produced electrical modules, such as Redarc’s excellent Manager 30 battery management system, or lithium battery systems like those from Enerdrive, is also ensuring some significant components have a local flavour. Likewise, locally made hitches such as Cruisemaster’s DO35 or AL-KO’s offroad hitch are now a commonplace on import campers. Additionally, some international manufacturers specialise in locally done paint jobs to ensure a customised approach. Many others use components that at least mimic Australian materials. Hence, we've seen a reduction in the use of ripstop canvas, because ripstop used to give away Chinese origins; now, we are seeing more plain weave canvas of traditionally Australian style. However, in some areas the distinction remains clear. The old ruse of telling people their camper was made in Australia because it was assembled from flat-packed components, much as you would assemble an IKEA cupboard, has largely disappeared. Also, some local producers proudly fight for Australian origins, resisting the pressures to cut overheads and control price. Local Australian builders simply couldn’t compete with sidefold softfloor campers at US $1500 to US $2000 each. Neither could they compete with hard floors at US $2000 to US $2500 each. These were the sorts of prices being offered by a number of Chinese factories a couple of years ago. The Chinese government’s support of the industry makes it increasingly difficult for Australian manufacturers to compete on price. The Chinese government recently gave a large parcel of land to one company, co-opted a CEO from a car company and grabbed a chief designer from the aviation industry. How does any company here compete with that? Additionally, government subsidised wheels bring finished alloy rims down to just $40 each, which undercuts any Australian manufacturer. As local camper manufacturers at the cheaper end of the market were squeezed out by the imports, they found refuge in higher priced products, adding fridges, stainless steel kitchens, bigger awnings, heaters, multi-battery setups. Now, most local brands are selling to people with a serious budget, who want the best and are not being picky over every $100 in cost. These days it’s difficult to find a local manufacturers left in the under $40,000 end of the market. However, the importers have begun to chase that market segment as well, copying and undercutting the local market in many cases. One common cause behind the shortcomings of imported campers, most especially those from China, is that most who make them have never used them. As a result, imported campers are often complex to put up, requiring as many as 30 or 40 poles and spreader bars to fully erect the awnings, in addition to having to adjust every bow in the tents. This takes time, sometimes in excess of half an hour. Arriving at a location and setting up for this long, only to have to do it again the next morning – and twice a day everyday if you're on a long transport stage across country – can soon weary you of travelling. Another example is the use of heavy canvas. Canvas on imported campers is frequently of a very heavy grade, such as 16oz all over, when the old rule of thumb used to be 12oz for the roof and 10oz for the walls (some local manufacturers use even lighter sailcloth material). This heavy grade on imports adds considerably to the weight being carried and the effort required to set up and pack up camp. The big advantage you get with a locally made product is that you are buying from someone who probably uses the product, someone who built it, and someone who can and will modify it to sometimes a considerable extent to suit you, the customer. Their understanding of the product reflects in the design. For example, one of the big marketing points for all local manufacturers is speed and simplicity of setting up and packing up camp. An easy three or four minutes at the end of a long day’s drive is much more pleasant than a sweaty half hour of struggle. Additionally, should you have a problem, the brand are usually highly likely to offer you excellent service on warranty repairs, even well beyond the end of the formal time frame if the problem is due to a manufacturing issue. Most locally produced campers are essentially hand built to suit you. As such, human error is always potentially present. This can be seen in even the highest priced and best specced units. At the end of the day it’s how those problems are handled that counts. You want an honest admission of failure when it occurs and a willingness to fix the issue, not a speedy direction to the exit door. Pressure on sellers in Australia has in fact forced a rise in standards, and it’s likely they will continue to improve. Should you be buying Australian? As noted, you will struggle to find many all-Australian manufacturers in the under $40,000 market. Only Cub, Outback, Jayco, Cameron and Bayside fit that bill, so the range of choice isn't large. Only a decade back this list would have included over a hundred names. If budget constraints dictate that buying an import is your only option and you want to buy new, then by all means do it. If there’s a particular model or brand you like, regardless of country of origin, then go with it. However, it's so important to talk to existing owners, hire one and try it out, and ask lots of questions. Don’t be impetuous with your decisions. Look for design features and engineering that you feel will satisfy your needs and read the web chat pages. Check that wiring is adequate in size, especially in high current areas, such as to fridges, from Anderson plug to batteries (preferably 6B&S or larger), and most especially in 240 volt circuits. Check that red wires go to positive and black to earth and everything isn’t done in a jumble of colours or all the same colour. Check that bolts in suspensions and chassis are grade eight quality (as required by law). Switch every circuit on and off and ensure that it works. Test that slides move freely, that welds are neat and have not been subject to huge amounts of grinding (implying that it was pretty messy to start with and therefore probably not done by someone who knew what they were doing). Check that you don’t have to adjust every single bow in the tent, that there’s a certification sticker on the gas system and so on. If you are attached to the idea of supporting the local product but lack the budget, then you can always look into the secondhand market. Potential buyers have been turning away from paying money on used products when they can buy new imports for the same price. This has caused secondhand prices to fall significantly since the onset of the import revolution – making now the time to buy secondhand.